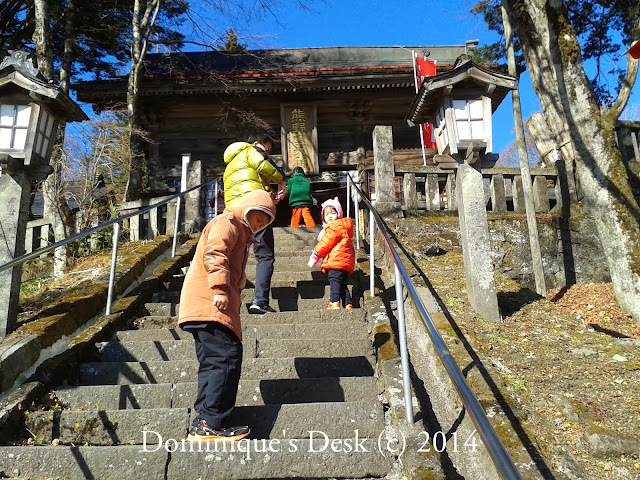 Kumanokotai Shrine was one of the places that we visited in December. It is located on the border line of Nagano and Gunma prefecture. It was about a half an hour drive from Karuizawa up the mountain road. This was a very unique shrine, On the Nagano side shrine is called KumanoKotai Shrine, and Gunma side is called Kumano Shrine. Here is enshrined the Holly sprits of Kumano. 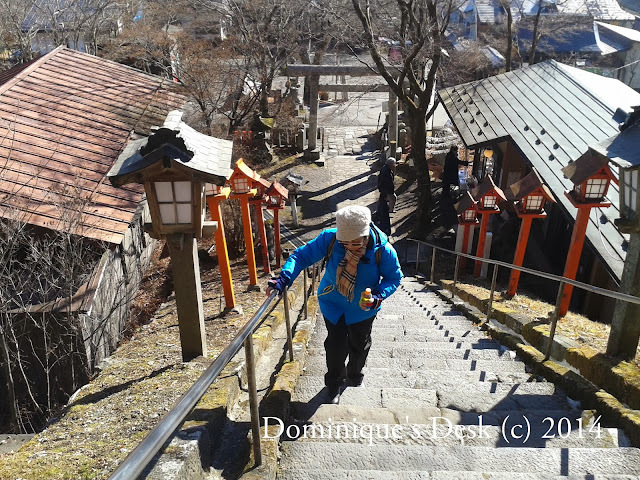 It was a short trek to the shrine but the steps were quite steep. Luckily Tiger girl was more then willing to climb up the flight of stairs and I didn’t need to carry her. I love the design of the lanterns that were aligning the staircase. I’m sure it would certainly make the path look really cozy at night. Like most Japanese shrines there was a board where one can ask favours from the GODs. You need to purchase the plague or special offering paper and write your wish on it before attaching it to the board. On the adjourning wall there were many plagues with the name of various Japanese households who have donated to the shrine. Besides penning down your wishes you could also purchase tailsmans for good luck, good marriage, kids studies etc. Unfortunately the shop was closed when we visited the place so I couldn’t see how they really looked like. Have you visited a Shrine before? I’ve never visited a shrine before although we were at the Met in NYC last week and explored a pharaoh’s tomb with the kids. Bringing them on adventures like this is so much fun, thanks for sharing. Great photos – I love it when you take us on tour! I love that ‘top down’ shot. I have been to a number of shrines, but in India and then of course to Christian ones in Europe and Aboriginal sacred sites in Australia. The last ones are the ones perhaps I got the most from because I visit for spiritual reasons…. and they do not have shops offering ‘bought blessings’. I have never visited a shrine before but I always find the architectural design so intriguing. What a neat place. The lanterns are my favorite as well. It looks like it was a cold day. It looks like a great place to visit, one that could be an awesome experience. Very nice pictures as well. I’ve never visited a shrine before, but with your beautiful photos, I feel like I visited this one! Really, you take wonderful photos. This is such a beautiful place indeed. Those lanterns all lined up are so awesome. What camera are you using Dom? Clear shots. I don’t remember if I visited a shrine before maybe I have but I wasn’t sure if it was a shrine lol. Nice capture of the places too, it’s nice to go a place like that where you can offer a prayer for different kind of things you wanted. Neat pictures! No, I’ve never visited a shrine before. I’ve never visited a shrine before. I don’t know if there are any here in Kentucky. I’d love to visit Japan though to see such a different culture. I would love to visit a Shrine, the one you went to is absolutely beautiful. Hopefully you can go back when the shop is open. I have visited a religious shrine here in the Philippines but I have not visited a Japanese one. Hi Dominique and hi everyone! That’s my first wordless-wordfull wednesday on this blog! I’m Wieczora (◔‿◔), from wieczorama-fotografie from Berlin of Gemany. Thanks for hosting this nice project and happy evening. I’ve visited a few shrines on our visit to Tokyo, but that was years ago, and I can’t wait to go back! Looks like an interesting place to visit. Enjoy the rest of your day! What a beautiful place to explore! I am interested about the tailsmans.